Many people say things on Islay happen in Islay time. Well, not only on Islay. The pictures from Islay I'm going to post today have been in my inbox for a few days, for some reason I haven't got around to post them earlier. A friend from Islay sent me the first two pictures asking if I wanted to guess where this was? 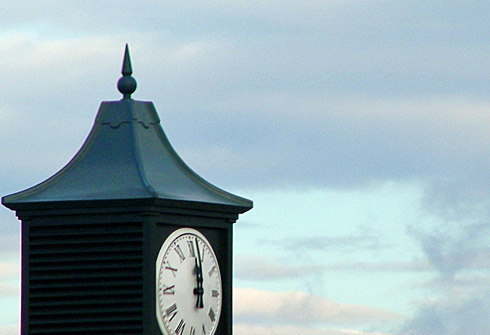 A pagoda style roof tower with a clock? Something in my head told me I should know where this is. But I couldn't figure out what it was. I wasn't really getting anywhere. What was the other clue? A roof. And it looks fairly new. There were also the tops of what looked like scaffolding poles just visible (not in the picture above, I cropped it to fit it in here). May be it was something new I just thought I knew but hadn't actually seen yet? 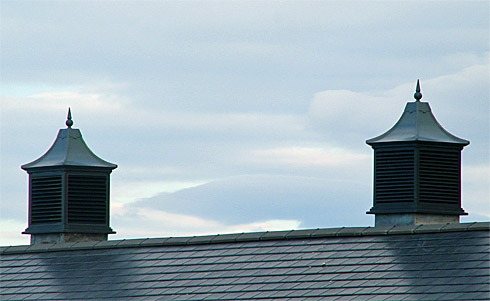 I knew there was a very similar clock at Laphroaig distillery, but that was on the wall. May be there was another one? 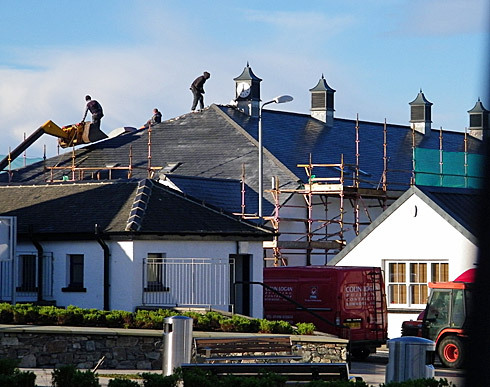 I also had a vague memory of reading about some roof repairs at the Mactaggart Leisure Centre in Bowmore, but wasn't sure about the timing. And I couldn't recall a clock on that roof either. Yes, it was indeed the Mactaggart Leisure Centre. Now with a new roof and some very nice looking roof towers, one with a clock. I think this is a great addition to the centre and Bowmore, looks really nice. But what will it mean to Islay time?